Profile: The Foundation for Research and Technology Hellas (FORTH), established in 1983, is the largest Greek State R&D Center. FORTH hosts six major Research Institutes. The Institute of Computer Science (ICS) has established an internationally acknowledged excellence in conducting basic and applied research, developing applications and products, and providing services. 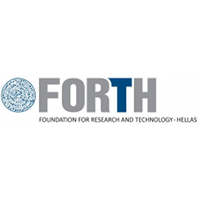 FORTH, besides its pioneering contributions in the sector of Information and Telecommunications Technologies in Greece, cooperates, in the context of European and international collaborative R&D programs, with universities, research centers and other organizations at national and international level, thus contributing to the exchange of scientific ideas and the creation and transfer of new technologies. The research directions at ICS take into consideration the State-of-the-Art, international trends, research and technological challenges worldwide, as well as the national needs of the public and private sectors. FORTH represents Greece in the European Research Consortium for Informatics and Mathematics (ERCIM), an organization dedicated to the advancement of European research and development in the areas of information technology and applied mathematics. FORTH has adopted an evolving strategy towards promoting the commercial exploitation of R&D results by providing services, licensing specific products to industrial partners, contracting with industrial partners to jointly develop new products, and participating in start-up / spin-off companies and joint ventures. FORTHnet S.A., a spin-off company of FORTH, was founded in 1995, and is now quoted in the Athens Stock Exchange, while it continues to be involved in related R&D activities. FORTH has played a major role in the development of the Science and Technology Park of Crete (STEP-C). PRAXI Network, a distinct administrative unit operating within FORTH, has been established in 1991 as a strategic partnership of the industrial and research world in Greece (FORTH, SEV Hellenic Federation of Enterprises and FING – Federation of Industries of Northern Greece) with the main aim to support the competitiveness of the Greek SMEs and RTOs by forging sustainable links between research and industry, through technology transfer and innovation support. PRAXI Network is offering its technology transfer, high added value innovation support and internationalization/partnering services throughout Greece by operating offices in three large cities of the country and having established strategic partnerships with key local, regional and national stakeholders. PRAXI Network was operating as one of Europe’s Innovation Relay Centers (IRC) from 1995 to 2008 acting therefore as one of the main Greek stakeholders in the field of technological innovation and cross-border technological cooperation. Since 2008, PRAXI Network provides technology transfer and innovation support services, both as the coordinating entity (2011-2012) and member of the Greek consortium of the Enterprise Europe Network. In parallel and since 1999, PRAXI Network has been appointed by the General Secretariat for Research & Technology in Greece as the National Contact Point (NCP) for the 5th, 6th and 7th Framework Programmes for Research and Technological Development and currently Horizon2020, rendering it an official entity for information and advisory support for EU-funded research programmes. PRAXI Network also hosts the National Representative for the “Innovation in SMEs and Access to Risk Finance” H2020 Programme Committee. PRAXI Network has been cooperating with National Stakeholders for identifying the Greek technology portfolio and contributing to its structured promotion at international level. Expertise and Role in CONCORDIA: FORTH will serve as Project Scientific and Technical Manager, be part of the Management Boardl and lead WP5. As a R&D center it will also provide the off-the-self security related solutions and technologies that have been developed within FORTH. Towards this end FORTH contributes in almost all the tasks of WP1 which are related to technologies/components design and implementation. FORTH, and its unit called PRAXI, will also share the know-how and the established links that PRAXI has with SMEs and other organizations to further enhance the innovation and technology transfer activities that will be performed throughout the duration of the project.